By the time Christmas rolls around, my Amazon wish list is full of cookbooks. I hit the jackpot this year by getting four of them. My mother-in-law is pretty good about taking care of that. One of my favorites so far is The Back in The Day Bakery Cookbook. Everything in it looks amazing, but the first thing that I had to make were these Oatmeal Coconut Cookies. I really liked them. While the coconut taste is subtle, I think it lends a little something to the texture, which I really enjoyed. Preheat oven to 350 degrees. Line two cookie sheets with parchment paper or silicone baking mat. Sift together the flour, baking soda, salt, cinnamon, allspice, and cloves. Set aside. In the bowl of a stand mixer fitted with a paddle attachment, cream the butter, sugar, and brown sugar together on medium speed until light and fluffy, about 3-5 minutes. Add the eggs and vanilla and beat again until light and fluffy, 1-2 minutes. Mix in the oats until just combined. Add the dry ingredients in thirds, beating until just combined, no more than 2 minutes. Sprinkle in the raisins and toasted coconut and mix until just combined. Transfer the dough to another bowl and finish mixing by hand to make sure no bits of flour or butter are hiding at the bottom of the bowl and the dough is thoroughly mixed. Use a large ice cream scoop to form the cookies and place the dough on the prepared cookie sheets, leaving about 1-inch between the cookies to allow for spreading. Lightly tap each cookie with the palm of your hand and then sprinkle the tops with a pinch of sugar. Bake for 10-12 minutes, rotating the pan halfway through the baking time for even doneness. Cookies should be golden brown. Let them cool on a wire rack and store them in an airtight container for up to 3 days at room temperature. This recipe made 24 cookies for me. I love that cookbook! I need to steal, urm, borrow it from my mom! 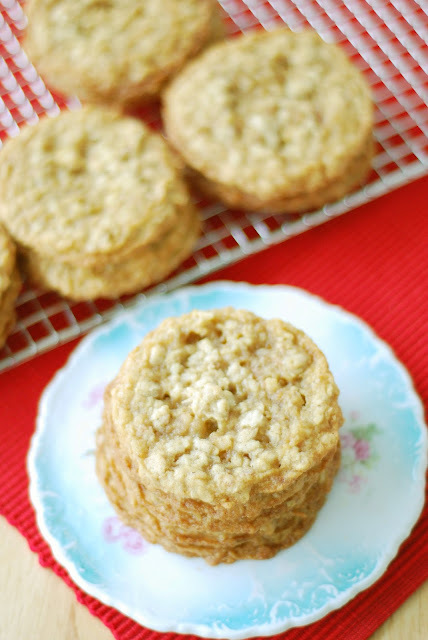 Oatmeal and coconut make the best chewy desserts! These cookies look amazing. Loving all those spices, too! Love, love, love oatmeal and coconut together! Gorgeous cookies! Sounds like a great cookie. I'd be tempted to add chocolate chips. Those sound delicious! Sadly, I'd have to find someone to take them off my hands because my husband hates flaked coconut and I can't eat the whole batch myself. Boo. I love everything about these cookies!! :) I'd be tempted to eat them all! !